Many moons after the Greek yoghurt explosion hit the Western World, Clover has joined the party, bringing a styled version to supermarket fridges. 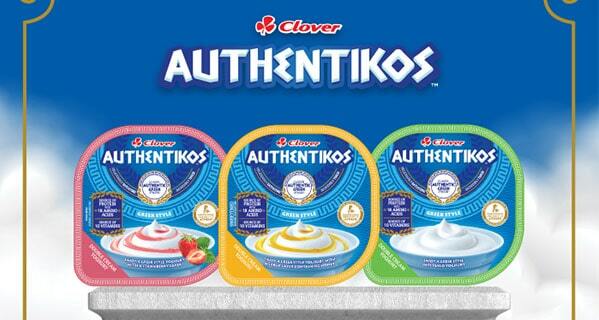 Clover’s recently launch of a new brand, Authentikos, is described as “a a deliciously creamy, thick and nutritious range of Greek-style yoghurt made using a Greek strain which was developed in Greece by the Agricultural University of Athens exclusively for Clover”. This “velvety-smooth snack” is available in three varieties, double cream yoghurt (sweetened), double cream yoghurt with strawberry and double cream yoghurt with honey. The 100g packs have a RSP of R8.49. Authentikos, says Clover, is infused with 10 Vitamins (A, D, E, B1, B6, Pantothenic Acid, Vitamin B12, niacinamide, Folic Acid and Biotin) and it is a source of protein with 18 amino acids, ideal to enjoy during snacking moments, for dips or food preparation. Traditional Greek yoghurt is made by fermenting milk with live bacteria cultures. The yoghurt mixture is then strained, sometimes multiple times. This straining process is what gives the yoghurt a rich velvety texture because the liquid whey is removed. Greek-style yoghurt, on the other hand, has not been strained and often contains added milk solids and artificial thickeners such as gelatin, modified starches and gum which are added to produce the same creamy texture, but with a longer shelf life.